TLEs generally last anywhere from less than a millisecond to more than 2 seconds. The first video recording of a TLE was captured accidentally on July 6, 1989. Researcher R.C Franz had set up the camera to be used on a future rocket launch and pointed the camera to view the night sky at zenith to capture images of star fields and/or whatever appeared. He left the camera running for the duration of the night The next morning when the video was viewed there were 2 finger like vertical images, appearing in only two frames of the film. The next video recordings of a TLE in 1989 was during the Shuttle Mission STS-34 while conducting the Mesoscale Lightning Observation Experiment. On October 21, 1989 TLE'S were recorded during the Shuttle orbits 44 and 45. TLEs have been captured by a variety of optical recording systems, with the total number of recent recorded events (early 2009) estimated at many tens-of-thousands. The global rate of TLE occurrence has been estimated from satellite (FORMOSAT-2) observations to be several million events per year. Sprites are large-scale electrical discharges which occur high above a thunderstorm cloud, or cumulonimbus, giving rise to a quite varied range of visual shapes. They are triggered by the discharges of positive lightning between the thundercloud and the ground. 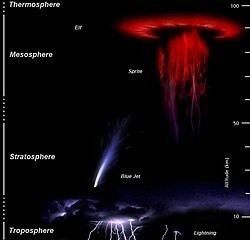 The phenomena were named after the mischievous sprite, e.g., Shakespeare's Ariel or Puck, and is also an acronym for Stratospheric/mesospheric Perturbations Resulting from Intense Thunderstorm Electrification. They normally are colored reddish-orange or greenish-blue, with hanging tendrils below and arcing branches above. They can also be preceded by a reddish halo. They often occur in clusters, lying 50 kilometres (31 mi) to 90 kilometres (56 mi) above the Earth's surface. Sprites have been witnessed thousands of times. Sprites have been held responsible for otherwise unexplained accidents involving high altitude vehicular operations above thunderstorms. Although jets are considered to be a type of upper-atmospheric lightning, it has been found that they are components of tropospheric lightning and a type of cloud-to-air discharge that initiates within a thunderstorm and travel upwards. In contrast, other types of TLEs are not electrically connected with tropospheric lightning—despite being triggered by it. The two main types of jets are blue jets and gigantic jets. Blue starters are considered to be a weaker form of blue jets. Blue jet as seen from the summit of Mauna Kea, Hawaii. On September 14, 2001, scientists at the Arecibo Observatory photographed a gigantic jet—double the height of those previously observed—reaching around 70 km (45 mi) into the atmosphere. The jet was located above a thunderstorm over an ocean, and lasted under a second. The jet was initially observed to be traveling up at around 50,000 m/s (110,000 mph; 180,000 km/h) at a speed similar to typical lightning, increased to 160,000 and 270,000 m/s (360,000–600,000 mph; 580,000–970,000 km/h), but then split in two and sped upward with speeds of at least 2,000,000 m/s (4,500,000 mph; 7,200,000 km/h) to the ionosphere where it then spread out in a bright burst of light. On July 22, 2002, five gigantic jets between 60 and 70 kilometres (35 and 45 mi) in length were observed over the South China Sea from Taiwan, reported in Nature. The jets lasted under a second, with shapes likened by the researchers to giant trees and carrots. ^ "Midsummer Night Brings Sprites". Retrieved 24 June 2015. ^ C. T. R. Wilson (1924) "The electric field of a thundercloud and some of its effects," Proceedings of the Physical Society of London, 37 (1) : 32D-37D. Available on-line at: University of São Paulo. ^ Earle R. Williams (November 2001) "Sprites, elves, and glow discharge tubes," Physics Today, 54 (11) : 41–47. Available on-line at: Physics Today Archived 2012-05-27 at Archive.today. ^ Boccippio, D. J.; Williams, E. R.; Heckman, S. J.; Lyons, W. A.; Baker, I. T.; Boldi, R. (August 1995). "Sprites, ELF Transients, and Positive Ground Strokes". Science. 269 (5227): 1088–1091. Bibcode:1995Sci...269.1088B. doi:10.1126/science.269.5227.1088. PMID 17755531. ^ "Sprites and Elves in the Atmosphere | Penn State University". ^ STRATOCAT – Stratospheric balloons history and present. "Full report on the uncontrolled free fall of a stratospheric balloon payload provoked by a Sprite". ^ 'Red Sprites & Blue Jets – the video', 'Blue Jets & Blue Starters – the video'. ^ Examples may be seen in the clip 'Blue Jets & Blue Starters – the video' . ^ a b Boeck, W. L.; et al. (May 1998). "The Role of the Space Shuttle Videotapes in the Discovery of Sprites, Jets, and Elves". Journal of Atmospheric and Solar-Terrestrial Physics. 60 (7–9): 669–677. Bibcode:1998JASTP..60..669B. doi:10.1016/S1364-6826(98)00025-X. ^ V.P. Pasko, M.A. Stanley, J.D. Matthews, U.S. Inan, and T.G. Wood (March 14, 2002) "Electrical discharge from a thundercloud top to the lower ionosphere," Nature, vol. 416, pages 152–154. ^ Yang, Jing; Feng, Guili (2012). "Chinese Science Bulletin 2012, Vol. 57 DOI: 10.1007/s11434-012-5486-3". Chinese Science Bulletin. 57 (36): 4791. Bibcode:2012ChSBu..57.4791Y. doi:10.1007/s11434-012-5486-3. ^ "Spaceweather.com Time Machine". spaceweather.com. Retrieved 2016-08-16. ^ "Gigantic jets over Australia".